Today,we’re pleased to announce an innovative alliance with Verizon. It’s a partnership that combines DreamFactory’s REST API platform with Verizon’s secure cloud services to deliver a turnkey cloud-first development environment tuned for mobile, web, and IoT developers. Check out the free DreamFactory-Verizon Partner Solutions portal, available now at verizon.dreamfactory.com. The growing importance of software has expanded the role of developers, impacting platform decisions that in the past had been entirely in the domain of IT. At the same time, the catalog of robust cloud services is exploding up and down the stack, offering developers progressively higher levels of automation and componentization. This has led to a distinct shift in the marketplace in which development teams have greater influence on which clouds to use, and when, throughout the application lifecycle. It is now more important than ever to serve developers’ needs earlier in the application lifecycle — especially at the start of new projects. Otherwise, developers may initially choose and stick with a competitor’s cloud. Moreover, this pattern is expanding as enterprise application developers increasingly need to deploy more workloads in the cloud, as well as access other cloud services in their apps. So starting in the cloud for development and test now makes a whole lot of sense. However, what developers often discover is that public IaaS is not set up for this part of the lifecycle, as IaaS providers tend to tune their self-service capabilities for operations teams and don’t necessarily offer the out-of-the-box services needed for cloud-first development. 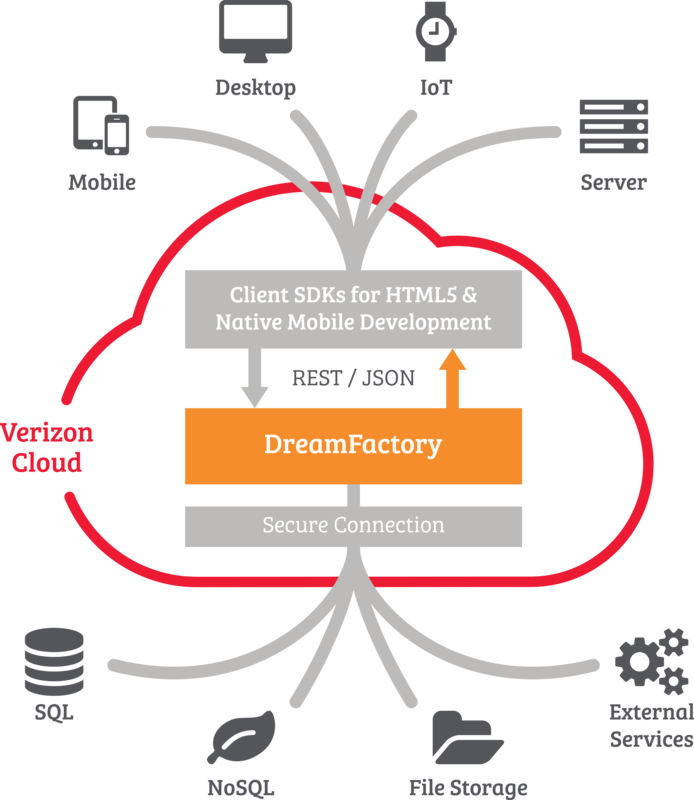 The DreamFactory-Verizon Partner Solutions portal addresses a key developer need: a frictionless way to instantly access RESTful API services hosted on IaaS, plus an easy progression of those new dev/test workloads to production — all in a secure, scalable, cloud-hosted environment. A fully configured REST API services platform hosted on the Verizon Cloud. Instant access to REST APIs and live API documentation for connecting to multiple data sources, including SQL, NoSQL, file storage, and external web services. An automated way to turn existing databases into REST endpoints for developers to use in the sandbox and build new integrated workloads. Multi-level security for providing secure access to data sources during dev, test, and ultimately production. An easy progression of workloads into secure, scalable production environments on the Verizon Cloud. We believe DreamFactory running on Verizon’s secure cloud platform will help make cloud-first development easier. And that’s a good thing. Project teams will benefit from shorter development cycles with a smooth path to production in a secure, cloud-hosted environment. You can see Verizon’s take on things in their newscenter. If you’re looking for an enterprise-grade, cloud-first development environment to prototype, deploy and scale your next application, we invite you to check out the new DreamFactory-Verizon Partner Solutions portal.